This is Otonashi park (音無公園, otonashikouen). There is an artificial river in the park, and it's very relaxing. Otonashi Park (Otonashi-Shinsui-Park) is right next to Ouji Station. There was a Otonashi-river in this region in the past. The river and the bank of the river were well known for the beautiful sight. 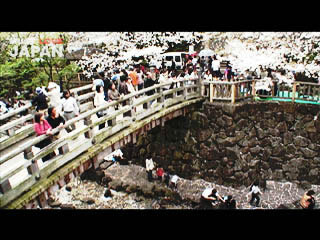 Today, the river flows in different region, but people tried to keep the sight; thus created the Otonashi Park. The name Otonashi-Shinsui-Park literally means "Otonashi Warter Friendly park." As the name suggest, the artificial river through the park is the most famous attraction; in the summer time, children are playing around in the river.